Nothing brightens up the winter months like citrus fruits. This Cake is a delicious alternative to a flour cake .You still get the your cakey cake experience but this one is delightfully sunny and gluten free ! Quarter mandarins, cover and microwave for 3 minutes . Reserve any juice from the bottom of the bowl and set aside for the icing . In a Kitchen Aide mixer fixed with the paddle attachment (or use a kitchen beater) beat eggs and sugar for 5 minutes until light and fluffy. **Blitz warm (not hot) mandarins in blender until pulpy and soft. Add mandarins to sugar egg and zest mixture and combine. Add Almond meal, baking powder and sea salt- mix to combine. Stir in blueberries and pour into greased baking pan. Bake for 35-45 minutes . Test cake by inserting a toothpick- *cake is done when toothpick comes out clean. Remove from oven and cool completely on a wire rack. Remove cake from pan and place on a rectangle serving platter. Place Juice and zest in a bowl. Add icing sugar a little at a time and whisk until you achieve your desired. consistency. Glaze should be thick and pourable. Pour over cooled cake . You may have some extra icing , just pour it into a small pitcher and serve on top of slices the of cake! 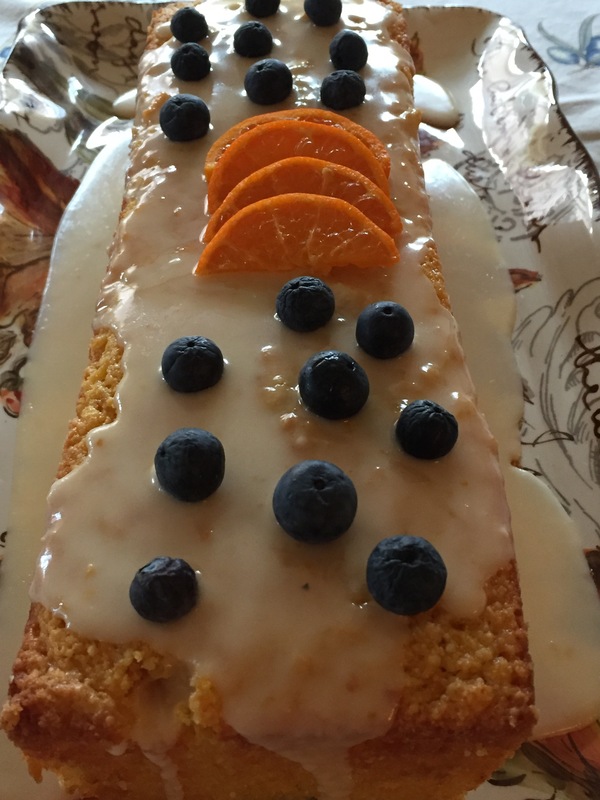 This entry was posted on Sunday, February 28th, 2016 at 5:18 pm	and tagged with cornmeal cake, glazed mandarine cake, gluten free corn cake, gluten free mandarine cake, mandarine cake and posted in Category. You can follow any responses to this entry through the RSS 2.0 feed.